Hard of Heart should look familiar. The bottom half is pretty much Ardent Predator and the costs match. The main difference between this and Ardent Predator is the type, with you being able to play this on a planet..
Is this new? Not at all. Decipher had dilemma ‘siblings’ going as far back as Call to Arms, with A Bad End and Don’t let it End this Way being pretty much copies of each other. Then designer Evan Lorentz said that they were specifically not a dual dilemma because that would be a little too good, so they were split. So a new thing for the Committee then, right? Not at all. 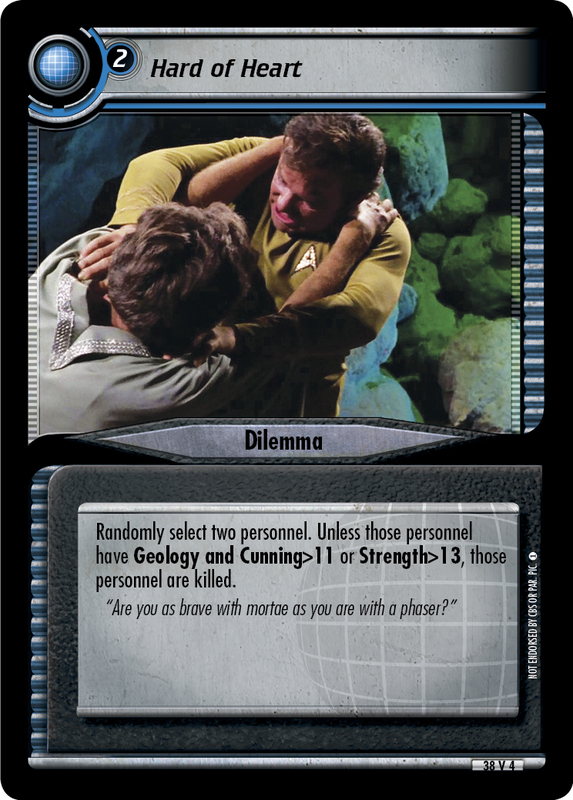 As recently as Lower Decks and as far back as The Undiscovered Country, there have been dilemma sibling. The first time the committee has made a ‘sibling’ of another dilemma? Nope. The Twentieth Anniversary Collection featured a dilemma sibling as well. And Hard of Heart is not alone in this set; the dilemma on the other side of the expansion sheet is another sibling of a very popular dilemma. So why make these versions? It happens often enough in games that you get a dilemma that you would love to play but don’t have the appropriate icon. Well, now you do. In fact, if you play with no dual dilemmas, there is an achievement you can get! Granted, it is risky, particularly if you have one to spend on dilemmas, making it a fifty-fifty shot, or somesuch. Well, there’s Unexpected Difficulties, Uninvited, and all those other dilemma tricks we’re been using since the beginning of time to cheat your way when you get desperate for salvation. So here are a few sibling dilemmas to look at. This is not exhaustive; the eight costers from Necessary Evil aren’t in there as those are situational. Feel free to use what you want, but if you succumb to temptation and put in a dual, you lose out on the achievement! Casualties of War/Training Accident: Cheap has been in since day one, and this has a decent shot of hitting against the right deck, particularly those with cost efficient skill support. Maquis Vendetta/Shields Up: Requiring common skills for multiple stoppage? At the right mission, these will be devastating. Aftereffects/Preventative Repercussions: A little riskier than Casualites/Training but a lot more deadliness potential. Breaking the Ice/We’ll Never Know: Fairly tough requirements even without a setup. The Charming Mister Riker/The Gentleman Doctor McCoy: Even without Kor joining the fray, these two pack a pretty good punch late in a mission attempt with the personnel leaving play entirely. Pillage and Plunder/The First Duty: Not the easiest of requirements involving rare skills that your opponent will either breeze through or be confounded upon. One Step Ahead/The Launching: While there are two sets of requirements, it may boil own to only one. Note that you can get a stop even if it is passed. Eugenic Transformation/Malfunctioning Door: The attributes might require a bit of setup, but as you hold it in your hand after drawing, you’ll know if this one can be a winner. Dubious Decoy/On Guard: Great dilemmas to lead off with and get a great stop right off the bat. A Taste of Armageddon/Simulated Prey: You will get rid of someone who can help complete the mission. Maybe a bit more if you have the right hand. With just a little bit of restraint and some support from your deck, you'll be able to surprise your opponent and yourself!